While not earth shattering, it's important. Some modelers have had issues and struggles with the phosphor bronze ladder stiles that have been included in past kits. And if the stiles aren't perfectly etched and if the modeler doesn't have the right tools folding those stiles can be a real trial. They'll fold far easier and generate far less swearing. The other part of this, is that I will also be including etched ladder rungs. They're far easier to work with and are being made in a variety of widths. Far less tedious than clipping the legs off of commercial grabs and less counting for Pierre. (yes that's what it's really about). We're always looking to improve and do what we can to get more people building models. I've been chipping away at scenicing the yard area in St Thomas. More ground cover. Some trees. And details in the Car Department area. Lots more to go, but Rome wasn't burnt in a day! Trees! Those pesky essential scenic elements that can drive us to distraction trying to get convincing looking models. And unless you're modeling the desert, you're going to need a lot of them. For awhile I thought that the Super Trees from Scenic Express were the answer, but I found that the "trunks" were too thin to represent the size of trees I wanted on the layout. The Super Trees might be great for background trees, but on a layout as narrow as mine, all trees are foreground trees. I fiddled briefly with the idea of wire armatures and then coating the resulting "tree" with some form of goop to replicate bark, but that is feeling far too labourious. It may yet come back for certain effects. Currently my solution is these very nice armatures from Model Builders Supply, they come in a variety of heights and the price in a bulk pack isn't too crazy. The best part of these armatures is that they are molded in 3 dimensions, unlike the Woodland Scenics armatures that are molded flat. The 6" and 8" are shown here with the "branches" twisted horizontal. The next step is the application of Poly-Fiber. Tease out little clumps and stick it on the armature. I'm still working through refinements of this part of the process, but you get the idea. This is secured in place using a matt spray varnish. I just grabbed a spray can from the hardware store. It works great. Far better holding power than hairspray, and easier than Tacky glue or other such stuff. Once that dries, the tree is sprayed again with the matt varnish and Noch Leafs are sprinkled onto the Poly-Fiber. Once that dries the trees can be planted. This photo of the Car Department tracks in St Thomas is a wealth of detail information. 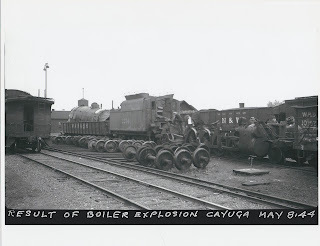 While the subject matter of the photo is the remnants of Wabash #2254 following a tragic boiler explosion, for me it's a gold mine for detailing an area of the yard that I'm actively working on right now. First is all the short bits of track holding spare wheelsets. There a lot of them and note the way the rails are doubled up to gain space by offsetting pairs of wheelsets. Then there's really narrow gauge track for some kind of work cart. I'd love to see a photo of the cart. And note how the rail joints are not offset. There's that water supply in the foreground. Simple enough, but it's a detail often overlooked. Just behind the caboose, we can see the lights on the pole. I do know from other sources that there were 2 of these poles. The 2nd would be to the right of the photographer. If you look closely you can determine where it's cinders and dirt, and where the weeds and other greenery would be. Lots of detail info to work with here. I find that I spend more time looking around the edges and in the back ground of photos than I do at the primary subject matter in railroad photos. There's so much to see and to learn about. 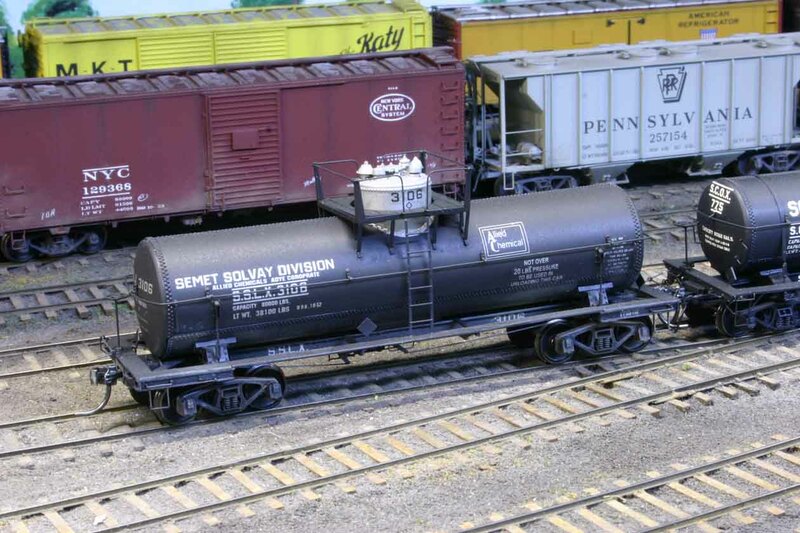 Anytime Railroad modelers do any kind of scenery these days, "wet" water is a mainstay item. The surface tension of water has to be defeated to get the water to flow onto and into the scenery materials being secured, in advance of adding the thinned matt medium or white glue. The usual approach is to add some liquid detergent into the water, or to use "Photoflow" from Kodak. And this approach usually works very well. But currently I'm using some groundcover products that are proving to be difficult to get the "wet" water to soak into. In particular is the "Light Cinders" from Scenic Express. There's a lot of very fine particles in the "Light Cinders " ballast and that seems to be causing the problem. But I've found a solution. I'm adding about 30% by volume of alcohol into the sprayer bottle along with a few drops of detergent. And man it works gangbusters! I'm finding that I'm spraying far less water than I used to get the texture materials ready to accept adhesive. I've been struggling with a certain part of the ground cover in the St Thomas yard area. 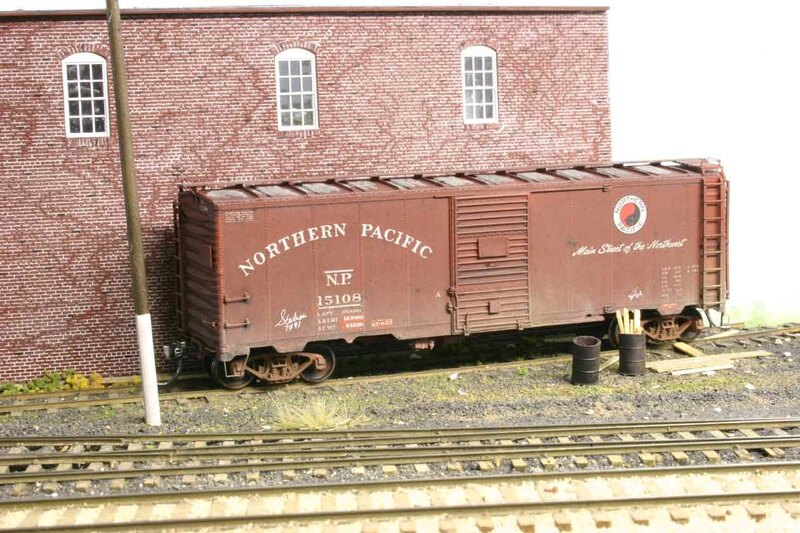 I use Scenic Express Light Cinders for the yard tracks, and wanted to have a sense of that kind of material in surrounding areas of the yard. So I've been playing with tile grout as ground cover. I've not had the kind of success with grout that others have. If I soak it with enough water to start the portland cement setting, there's actually too much water and the mix never really hardens. Soaking it and drizzling thin glue or matt medium results in a gloppy mess. What I had tried with mixed success, was brushing very slightly thinned glue onto the surface and then sifting the grout onto the glue. The trouble starts when adding texture and colour to adjacent areas. The glue tends to leave marks that look like water marks in the grout. As well as the top of the grout is still loose and the dyes in the grout can be picked up easily with an errant finger. So I wasn't in my happy place with this. The colours and marks I could address with airbrushing greys into the grout, but the looseness of the material wasn't cutting it. On a whim and a suggestion from Trevor, I scattered some Scenic Express Fine Natural Soil over the grout and set it in place with thinned white glue. Some of the grout dye was wicked into the dirt cover which helps keep some of the continuity of colour that I'm looking for. More importantly no more water marks and other unsightly stains, and everything is secured in place. Further colour shifts can be made with the airbrush and military colours. But first more static grass and other vegetation has to go in before I make that determination. Thanks for the suggestion Trevor! Don't think I'd have gotten there on my own. My buddy Ted Culotta has done it again. 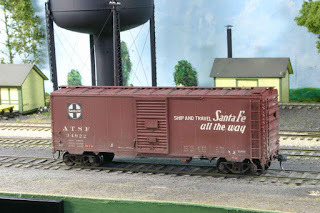 He's released another beautiful pair of kits, recreating the Ann Arbor RR single sheathed single door and automobile boxcars. Today I finally got the weathering finished and my trio are now part of the fleet. Ted and I have had discussions about how best to model ladders. Neither of us are big fans of molded plastic ladders. And he's not enamored with my etched ladders for all applications. So he's come up with a interesting technique for modeling ladders. A sub-frame of resin is in the kit in which the modeler lays wire rungs and then an overlay with rivets cast on is applied over top. An effective method, but I'm not 100% sold on the solution. Regardless, the kits build into very nice models and as always Ted's decals are first rate. Wonder what`s next from Speedwitch Media? One of the perils of being a "doer', rather than a ponderer, is that every now and then we paint ourselves into a corner. This little device illustrates this well. The first turnout in the St Thomas yard, at the west end, has it's head block ties right on the abutment, as you can see in this photo. The model abutments were reused from the old layout and I really didn't give the control of the turnout in question a lot of thought as I dove into getting the layout underway. I am not one to suffer from analysis/paralysis. Usually some form of inspiration occurs as work progresses. I was pleased with the mechanical aspect, but visually it wasn't working for me. So starting the other day I lowered the slide switch by about an inch to improve the way the slope is going to look once I cover the switch with scenery. With this done I can now look at building the switch stand platform in the near future. Painting brick, particularly brick in good repair or fairly new, has plagued me for years. Erie Ironworks had a plant right on mainline in St Thomas, built in the post-war era. It's been a struggle to find any images of this plant. 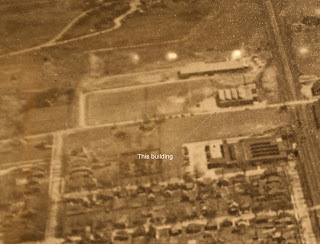 The best thing I have to work with is an old aerial photo. Pretty simple. One story brick factory with clerestory roof lights. 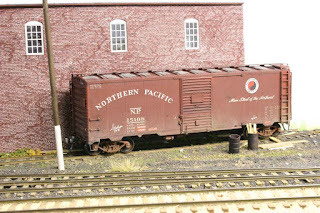 And a loading dock and dedicated spur. So I made some guesses and some leaps of faith. Took some Design Preservations modular panels and created a reasonable representation. The building painting though didn't work out well the first time. I had used Scalecoat Boxcar red 3 for the base and then flowed thinned grey acrylic paint for the mortar lines. As you can see from the first image not very nice. I stared at this for awhile, looked more images online and studied techniques and tried again. This time the base colour is Krylon Leather Brown, which I then lightly, very lightly over-sprayed with a Krylon primer red. I thinned the acrylic grey paint further by at least another 50% and flowed it onto the model. I'm feeling much happier about this. I still have to paint the concrete wall cap and loading dock deck, as well as finish the other 2 celestory units. Waiting for more window castings for that. From there I can install the windows and think about surrounding terrain. Well that certainly cheered me up! Not that I really needed cheering up, but it does the heart good. My friend and fellow modeler, Bill Darnaby, of The Maumee Route fame, just sent me 3 photos of my kits that he's built recently. As you can see he's done a stellar job of building these kits. And it's very gratifying for me to see my kits being enjoyed in the manner that I had hoped they would be. So thanks to Bill for sharing and here's hoping you get inspired.